Cycling and geocaching have been the most talked about among eight refuge uses which are being reviewed as being appropriate to start or to continue at the Santa Ana National Wildlife Refuge in Alamo. “Several years ago, before the flood in 2010, bicycling had kind of evolved from a few at a time to where it got really popular, and it got going before we formally evaluated it,” refuge manager Bryan Winton said. “It was conflicting with our tram tours and some of the birders and photographers were complaining about people riding on the dirt trails, and we had some Winter Texans and they’d bring a couple of trailers of bikes, like the whole park would come,” he recalled. The flood damage and resulting limited public access until levee repairs were made along the Rio Grande ended cycling on the 2,088-acre refuge. Winton said it has allowed refuge staff to reevaluate and come up with new guidelines. “We know from before the interest to do that here is high,” he added. “The challenge for us is we’ve kind of got our core audience that has always come here to do bird watching and hike the trails and they like the peace and quiet. Other activities being evaluated — federal guidelines mandate it every dozen years or so — include scientific research, participating in an oral vaccine program targeting gray foxes and coyotes and commercial visitor services like birding and butterfly tours. Also being studied are commercial videography, filming and recording, wildlife observation and photography, educational programs and virtual geocaching. Pretty much all of these activities are currently allowed, although some require refuge operating permits, and Winton says there have been few questions or concerns about them. But geocaching, a sport where participants use handheld Global Positioning System devices to find destinations or locations, is a potentially new activity which is creating some buzz. “We’ve been identified as a site for geocaching but the refuge is kind of restricted because we don’t want people digging” for hidden caches. These are containers with a paper which a geocacher signs as having “found” the secret spot and then replaces the canister for the next seeker. As might be expected, the hundreds of thousands of Winter Texans who arrive in the Valley each winter mean these months are the busiest at Santa Ana. 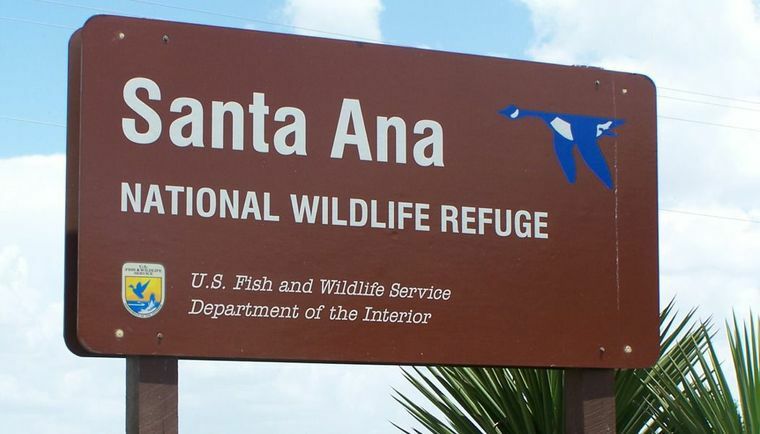 Yet Winton, who has served as refuge manager at Santa Ana for 12 years, says increasing the number of visitors to the refuge and diversifying the kinds of people who come aren’t related to refuge revenues. Although the refuge charges visitors $5 per vehicle, he said most Winter Texans have opted to purchase lifetime passes for federal facilities anyway, which means such fees are waived. “It’s not really about making money, it’s trying to connect with the local community down here and remain relevant into the future,” Winton said. “People are more often growing up in the city or urban areas and they’re not connected with the farm and hunting and fishing like they used to be,” he said, adding that both were core reasons why the federal wildlife refuge system was created a century ago. Bicycling — Bicycling on the refuge would be limited to individuals or groups under 10 on certain days on designated trails and roads from May through October. Scientific Research — Has benefited the refuge and is consistent with the goals and objectives of the refuge’s 1997 Comprehensive Conservation Plan. Requires a Special Use Permit. Oral Rabies Vaccination Program — Approximately one million individual vaccine baits to be dropped by aircraft along parts of the U.S.-Mexico border including the refuge’s 2,088 acres in January. Target animals include coyotes and gray foxes. Commercial Visitor Services — Commercial visitor services on the refuge cover birding or butterfly tours, plant identification, wildlife photography, art, interpretive programs, guided trail walks, training workshops, nature classes and other similar non-consumptive uses. Commercial videography, filming, or recording — Photography, videography, filming, and audio recording of natural, historic, or cultural subjects for commercial use. Special Use Permit required. Virtual geocaching — Geocaching is a virtual game played throughout the world by adventure seekers equipped with Global Positioning System devices. Virtual geocaching is the search for destinations or locations and does not involve a hidden container or other such item. Wildlife Observation and Photography — An existing priority activity which allows individuals or group access to the refuge by foot or on the tram. Environmental Education and Interpretation — Environmental education is a curriculum-guided process that helps students learn more about the environment.